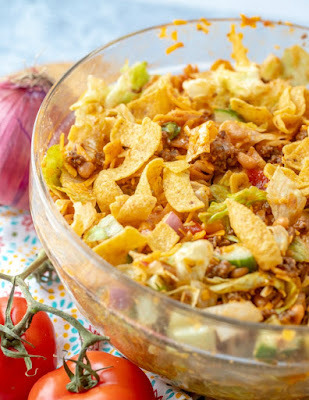 Frito salad is a fun twist on a taco salad. It is loaded with flavor and is perfect for potlucks, but also makes a fun dinner main dish. The homemade catalina salad dressing is easy to make and the salad is packed full of goodies. Take a salad and make it a dinner they'll actually ask for! 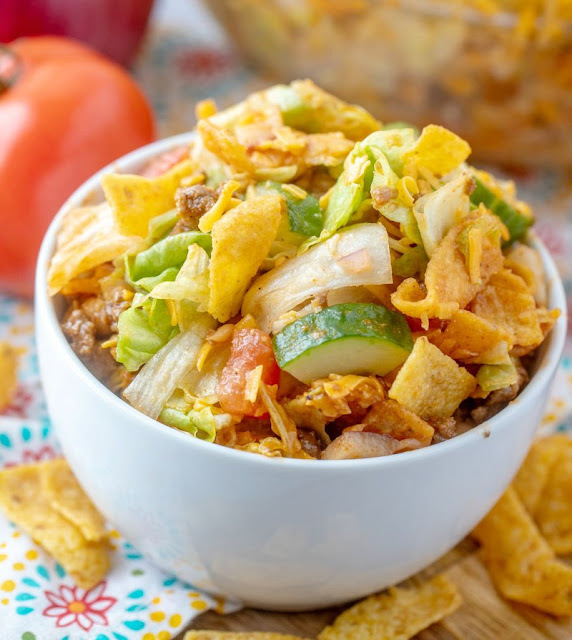 Frito taco salad is so much fun and a great way to get your family to eat their vegetables. 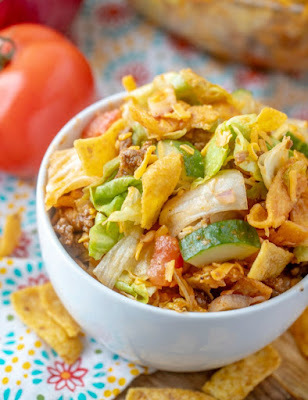 Bring it to a carry-in as a super fun side salad or add taco meat to make it a veggie filled dinner. The homemade catalina dressing doesn't get easier to make and brings the whole thing together! 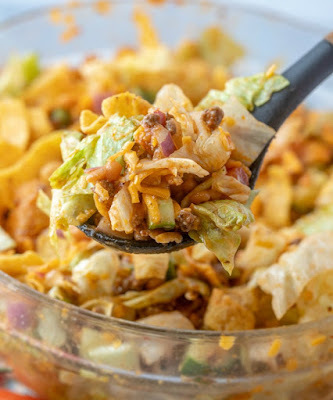 MiMi says she remembers a time where you couldn't go to a BBQ or potluck without there being a Frito salad there. I don't remember these times, so it must have been a LONG time ago. ;-) Just kidding MiMi, you are young and vibrant! Anyway, we were having some really special burgers for family dinner this week. Don't worry, you'll get the recipe. You'll just have to wait a little longer for it! Spoiler alert: it was my Maw-Maw's hamburger suprises. My Maw-Maw was making stuffed burgers before stuffed burgers were a thing! Anyway, she thought this would be the perfect accompaniment for it. I wouldn't exactly say it is the healthiest salad. I mean really, the name is Frito salad people! But, it was a really tasty side to our burgers. Even if it's not exactly a superfood, it is a super fun way to get your family to eat some vegetables. So in my book that is still a win! The catalina dressing is super simple to make and you may find yourself making that for other salads as well. You could keep a jar in your refrigerator for more salads or recipes like catalina chicken. All of the chopped veggies give a nice fresh flavor to the salad while the beans add lots of flavor and texture as well. 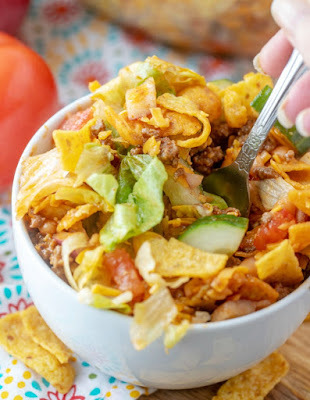 The Fritos give it a nice salty crunch that makes it extra fun! You can do most of the prep work ahead of time. Chop everything up and get it ready. You can even toss most of it ahead of time and store it in the refrigerator until you are ready. 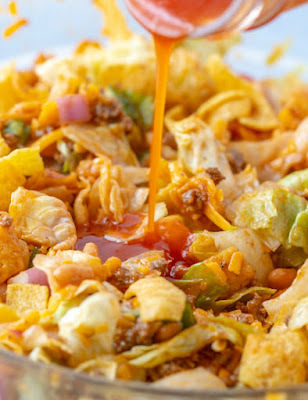 Just don't toss in the Fritos, beans and dressing until you are ready to serve. Or the taco meat if you are going full monte! You don't want anything getting soggy. Combine all the dressing ingredients in a mason jar. Shake and put in the fridge until you are ready to use it. If using taco meat: brown ground beef in a skillet, then add taco seasoning according to package directions. Set aside until ready to use. Chop all of your vegetables and arrange in a large bowl. Top with cheese and mix. Refrigerate until ready to serve. Then add the drained pork and beans, taco meat if using and Fritos and toss with dressing. Serve immediately after adding chips and dressing. I believe some people even put beef in there sometimes too. I think a taco seasoned meat would be perfect. It would make a really good taco salad. A little different than normal and really tasty!! It’s been a long time since I’ve had something like this too. Yum, I love a homemade Catalina dressing! I think I’ll go buy some Fritos! Have a marvelous Monday! You definitely should! It's a fun blast from the past. I've never heard of this but looks like a fun , different salad. Love the homemade dressing recipe! I buy variety packs and there's always more Fritos than everything else, now I know how to use them. This is a perfect use, thank you! My crew would love this! They are always adding 'crunchy' foods to their meals. I love the dressing recipe! This is definitely a fun one, I hope you all love it! I've never had one of these. It looks so good! Fritos are such a guilty pleasure for me. You are going to love this salad then! 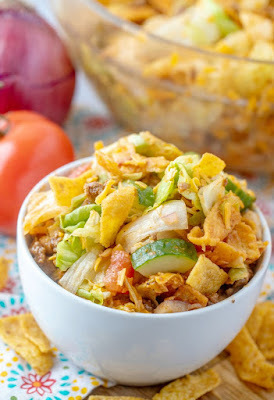 I kinda love a trashed up salad...and one with Fritos...well that sounds pretty good too!!! Me too, the more toppings the better! Love, love, love! Yeah for Fritos in salad! This is a perfect dinner! And so quick and easy. I be making this for dinner! Thank you!!! Yummy! I had something just like this earlier this month and it hit the spot! Aren't salads like this so good! My best friend makes a salad like this and it is so good! I love that you add cucumber to yours! It's a great fresh and crunchy addition! 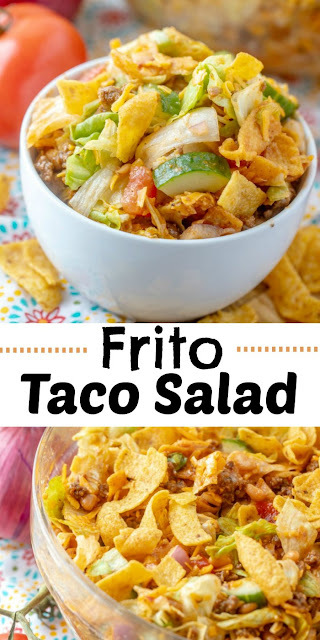 I've not had Frito's in a salad, but I will definitely be trying this! They are way better than croutons! This looks so good! So many delicious textures. I love using iceberg lettuce in salads. Me too, especially loaded salads with tons of goodies.